Most books on Evidence Based Medicine give little attention to the first two steps of EBM: asking focused answerable questions and searching the evidence. Being able to appraise an article, but not being able to find the best evidence may be challenging and frustrating to the busy clinicians. 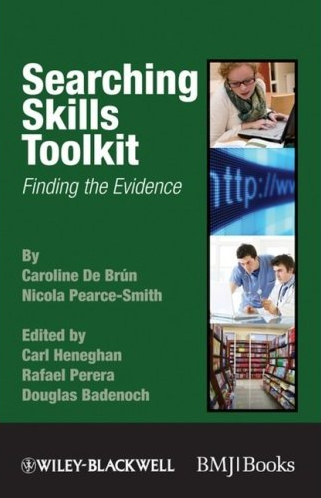 “Searching Skills Toolkit: Finding The Evidence” is a pocket-sized book that aims to instruct the clinician how to search for evidence. It is the third toolkit book in the series edited by Heneghan et al. 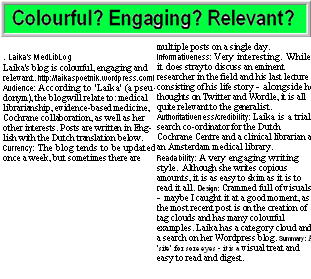 (author of the CEBM-blog Trust the Evidence). The authors Caroline de Brún and Nicola Pearce Smith are experts in searching (librarian and information scientist respectively). Does this book give guidance that makes searching for evidence easy? Is this book the ‘perfect companion’ to doctors, nurses, allied health professionals, managers, researchers and students, as it promises? I find it difficult to answer, partly because I’m not a clinician and partly because, being a medical information specialist myself, I would frequently tackle a search otherwise. The booklet is in pocket-size, easy to take along. The lay-out is clear and pleasant. The approach is original and practical. Despite its small size, the booklet contains a wealth of information. 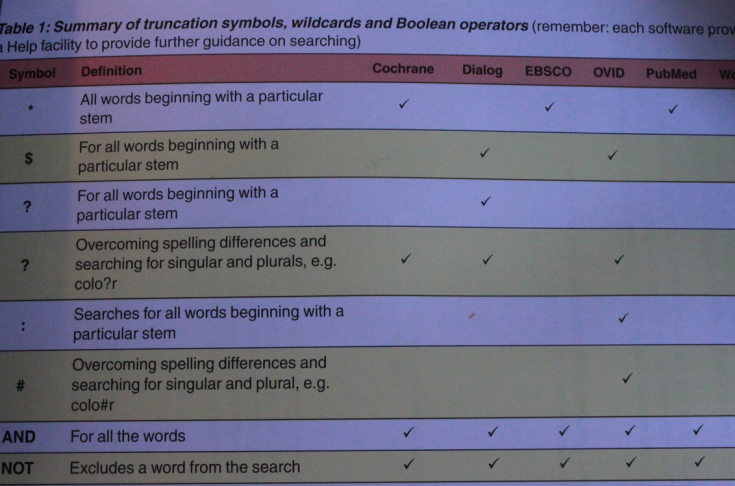 Table one, for instance, gives an overview of truncation symbols, wildcards and Boolean operators for Cochrane, Dialog, EBSCO, OVID, PubMed and Webspirs (see photo). And although this is mouth watering for many medical librarians one wonders whether this detailed information is really useful for the clinician. Furthermore 34 pages of the 102 (1/3) are devoted on searching these specific health care databases. IMHO of these databases only PubMed and the Cochrane Library are useful to the average clinician. In addition most of the screenshots of the individual databases are too small to read. 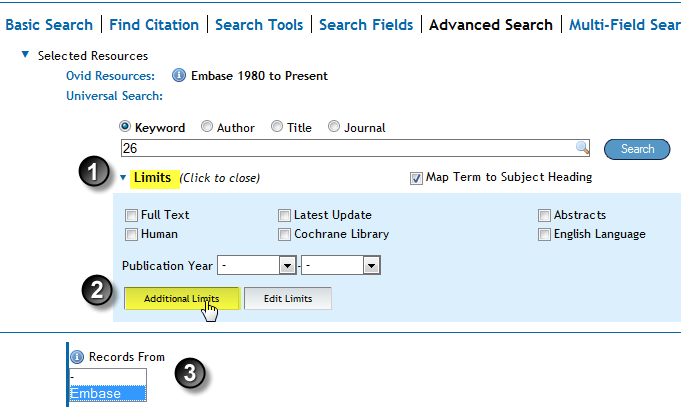 And due to the PubMed Redesign the PubMed description is no longer up-to-date. The time available to search: 5 minutes, an hour or time to do a comprehensive search. This is an important first step, which is often not considered by other books and short guides. Primary sources, secondary sources and ‘other’ sources are given per time available. This is all presented in a table with reference to key chapters and related chapters. These particular chapters enable the reader to perform these short, intermediate or long searches. What type of publication he is looking for: a guideline, a systematic review, patient information or an RCT (with tips where to find them). 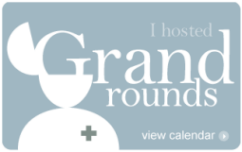 Whether the query is about a specific topic, i.e. drug or safety information or health statistics. All useful information, but I would have discussed topic 3 before covering EBM, because this doesn’t fit into the ‘normal’ EBM search. So for drug information you could directly go to the FDA, WHO or EMEA website. Similarly, if my question was only to find a guideline I would simply search one or more guideline databases. Furthermore it would be more easy to pile the small, intermediate and long searches upon each other instead of next to each other. The basic principle would be (in my opinion at least) to start with a PICO and to (almost) always search for secondary searches first (fast), search for primary publications (original research) in PubMed if necessary and broaden the search in other databases (broad search) in case of exhaustive searches. This is easy to remember, even without the schemes in the book. Some minor points. 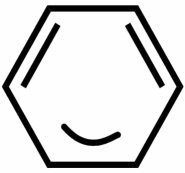 There is an overemphasis on UK-sources. So the first source to find guidelines is the (UK) National Library of Guidelines, where I would put the National Guideline Clearinghouse (or the TRIP-database) first. And why is MedlinePlus not included as a source for patients, whereas NHS-choices is? There is also an overemphasis on interventions. How PICO’s are constructed for other domains (diagnosis, etiology/harm and prognosis) is barely touched upon. It is much more difficult to make PICOs and search in these domains. More practical examples would also have been helpful. Pocket size, easy to take a long. Where to start? Summary tables and charts. 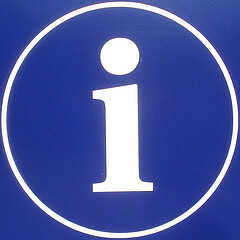 Sources of clinical information: an overview. Using search engines on the World Wide Web. Saving/recording citations for future use. 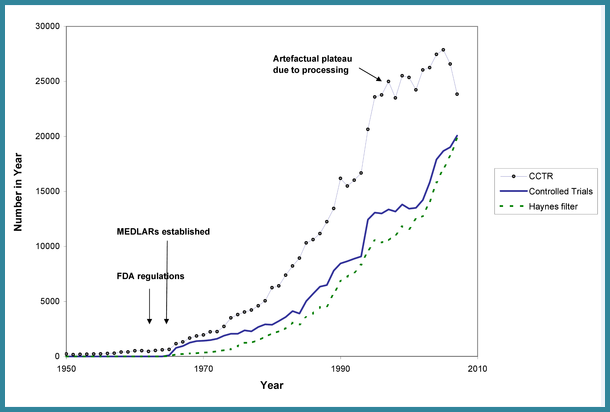 Further reading by topic or PubMed ID. Appendix 1: Ten tips for effective searching.